Wolf Blitzer is widely regarded as one of CNN’s most respected anchors, and The Situation Room is one of the top-rated political news programs on cable. But is there a correlation between the number of Wolf Blitzers appearing on the program and its ratings? Let’s break it down with data. It’s a little counterintuitive, as you might expect ratings to drop off as more and more Wolf Blitzers are added, but the graph actually shows a steady upward trend, maxing out at a Nielsen rating of about 20. In fact, it’s entirely possible those ratings would continue to climb if more Blitzers were added, but CNN’s floor is only rated to support 100 Wolf Blitzers. One detail you may have missed is that the ratings are actually better with an empty studio than with one Wolf Blitzer. There’s a drop-off at one, but the ratings jump way up when there’s at least a pair of Blitzers. Cool. So, it’s clear from the data that it’s the extra Wolf Blitzers that are drawing in the additional viewers. But why is this the case? The following graph shows the top reasons that viewers gave for being more likely to tune in the more Blitzers that were on TV. This graph shows what viewers said would make them even more likely to tune into The Situation Room. The numbers don’t lie. The data reinforces the view that the show’s subject matter has little bearing on how many viewers tune in, and that many viewers would prefer the Wolf Blitzers not to speak at all. 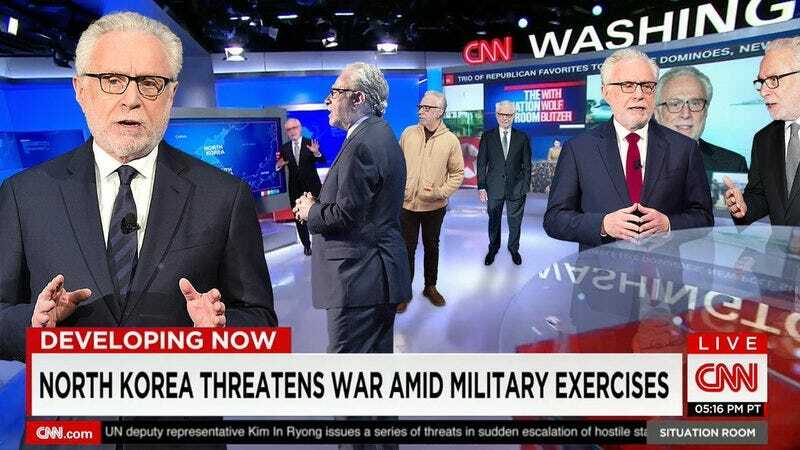 The emerging statistical picture strongly suggests that CNN’s optimal strategy would be to increase the quantity of Wolf Blitzers while experimenting with new formats, such as an episode that starts with a single Wolf Blitzer greeting a second Wolf Blitzer, shaking his hand, and giving him a large wrapped present that turns out to be a third Wolf Blitzer, or an episode that opens on a studio teeming with Blitzers with their backs turned to the camera who then turn to the camera and say, “We apologize, there is no news today,” one at a time for the duration of the program. Well, if you were looking for conclusive proof that more Wolf Blitzers equals better ratings, there you go. More research is needed to determine how additional Blitzers might affect other programs such as sitcoms, sporting events, classic films, and documentaries. Our hypothesis? Those extra Blitzers are really going to help.